Burton upon Trent has a long history of Brass Bands, which still continues. However, because of a very strong Local Education Authority policy in Woodwind tuition, the need for mixed Woodwind and Brass groups had caused a rise in Concert Bands in the U.K. In order to fill this gap in Burton on Trent, David Haines (our current Musical Director), held a meeting in 1992 of local woodwind, brass and percussion players. As a result of that meeting, the Burton Concert Band was formed. Several members of the original band still play with us regularly. The band celebrated its 25th Anniversary in 2017, and apart from regular concerts, has been very successful competing in national competitions, winning a gold medal in the Boosey and Hawkes Wind Band Finals. Once a year a guest conductor is invited to train the Band and supply new repertoire. Social events are also a regular part of the Band calendar. 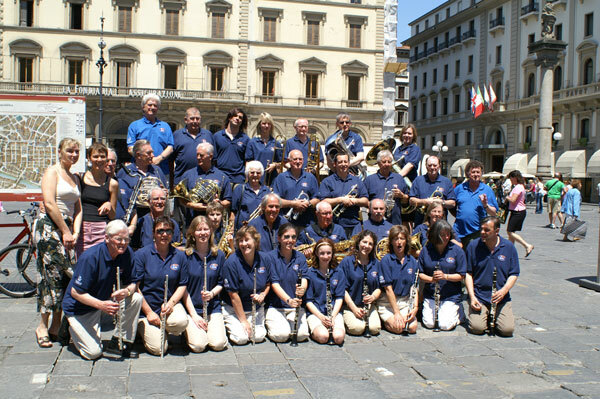 The Burton Concert Band on The Piazza De’Republica, Florence, during their 2006 tour of Tuscany. Born in the Rhondda valley during an air raid in 1940, David was put on a piano at an early age, but fell off. He started playing the trumpet in the early 1950s trying to emulate the famous Eddie Calvert. After school he attended the Welsh College of Music and Drama, at the same time as Anthony Hopkins. In 1958 David became the lead trumpet in The National Youth Jazz Orchestra and transferred to the Royal College of Music and started playing professionally. In 1962, seeking a more regular income, he started a teaching post in Lincolnshire – staying for three years, and enjoying it immensely. In 1965 he was appointed as Band Master to Repton School, which also supplied a house that was very welcome with his impending marriage. As luck would have it, trumpet players were in short supply in the Midlands but there was no shortage of good class playing engagements. At one such event, David was booked to play the Obbligato in the Christmas Oratorio with the famous Bass, Gordon Clinton. Gordon Clinton was also the head of the Birmingham School of Music. As a result of that one performance, young Haines was appointed as principal trumpet tutor aged 26. 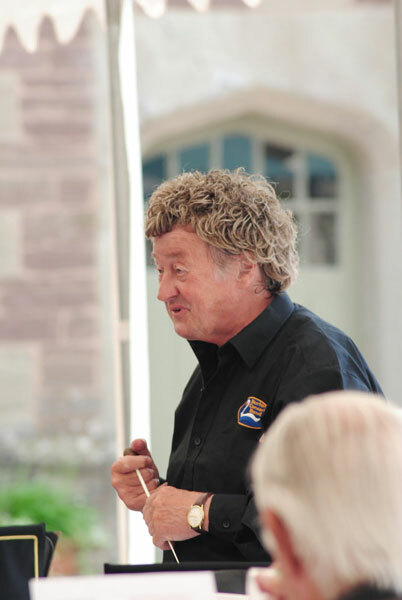 In 1974 David left full time teaching, keeping on the part time post in Birmingham until 1988, to concentrate on his business interests: Normans Ltd. and The Music for Schools Foundation. These are respectively the largest suppliers of Band and Orchestral instruments and the largest employers of Music Teachers in the U.K.
David has now retired and is hoping to boost the Band’s activities. His interests outside Music are very diverse, he is a keen squash player and skier, and is one of very few private helicopter owner/pilots.